Tired of sitting at a desk all year and think working on a farm, a brewery, a winery- some kind of hands-on international experience might be fantastic? Allow me to introduce you to Helpx. Steve Skews from Le Brewery in Normandy told me this site keeps his brewery going. He provides room and board, and people come from all over the world to provide labor. Brilliant! All ages participate- he had a woman in her 60s come and transform the gardens; a young Texan revitalized the website, an Australian couple did something else. I know I’ll be looking into this! 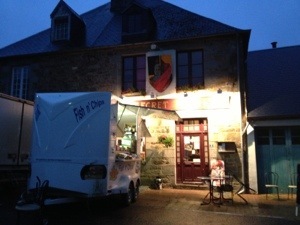 These photos are of the Secret Knight, one of Steve’s pubs in Normandy. 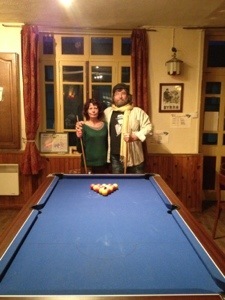 And Steve himself, with his genius right hand Christine. They are never not smiling, so in the picture they are about to burst out laughing. She won, by the way. Go Christine! Looks like you had fun! Have you noticed anything in particular that makes the beer unique to the areas? Grain bill sources? Techniques? Native yeasts or hops?